Two years ago, Tumblr founder David Karp shared some impressive numbers. In July 2009, Tumblr had 50 million visitors, 255 million pageviews, and 650,000 new posts per day. A year later, we noted that they were “on fire” with 6 million users and 1.5 billion pageviews. If that was being on fire, it’s hard to know how to describe them now. On their staff blog, Karp has just shared that Tumblr did 250 million pageviews — just yesterday. Yes, they’re now doing roughly the same number of pageviews a day as they were doing in an entire month two years ago. The data, which is being directly measured by Quantcast, doesn’t lie. And it’s amazing. 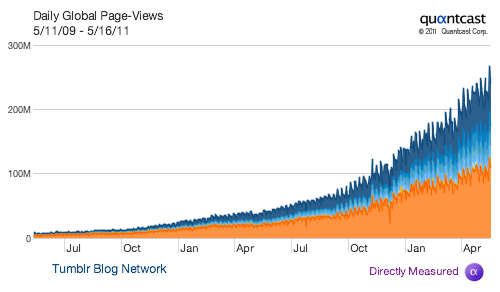 Tumblr is now doing roughly 7 billion pageviews a month — and it’s growing insanely fast. It was only mid-April that they hit 6 billion, and given the daily growth now, they’ll be at 8 billion shortly. A year ago, Tumblr users were doing 4.5 million posts a day. Remarkably, that number today should hit 30 million. The service now has 18.8 million blogs across its network, and there have been 5.5 billion posts in total. It was August of last year that they surpassed 1 billion posts — in less than a year, they’re up over 5x. Karp will be one of our guests this year on stage on day two at TechCrunch Disrupt in New York next week. The topic of discussion? “Managing Hockey-Stick Growth.” Given these amazing numbers and Tumblr’s issues with downtime in the past few months, the talk should be a great one.